Southwest Sumba Regent, Mark D Tallo said Rato title given to President Joko Widodo is an honorary title for Jokowi because it has been willing to come to the island of Sumba. "He is considered an elder to us because we have come to Sumba, and people are very happy to see the President," he told the media crew. He said in addition to the title, the Government and the people of Sumba, especially Southwest Sumba also awarded Jokowi, a parang ulu ivory, and a Sandelwood horse. "With the prize, it is complete that Mr. President is regarded as a Raito and it is also an honor for our people of Southwest Sumba," he added. The Regent also explained that the Horse is a symbol of the Knight for Sumbanese men and also a belis or dowry for Sumbanese women. Parang Sumba or known as Katopu is a sign of victory in the war for Sumba men. Therefore, with the horse and machete gifts are support as a knight who when Inu is leading Indonesia to become better. On the occasion the President also had time to ride a horse given by the community. 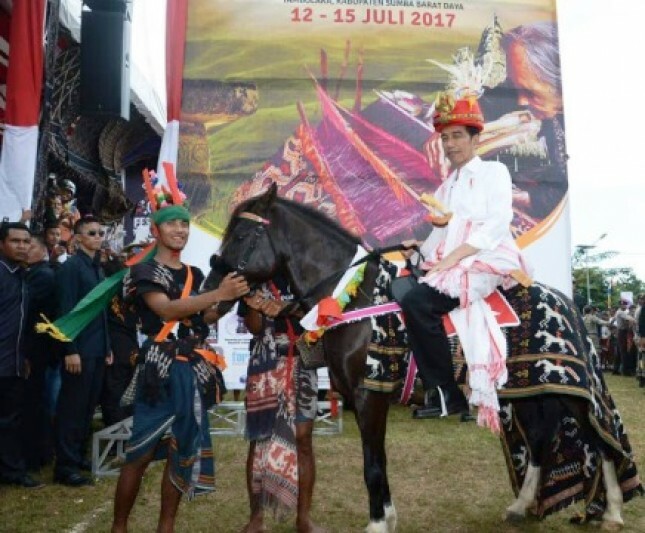 President of Indonesia Joko Widodo who is present and wearing a headband and woven cloth watching the festival of weaving and sandelwood horses look like a knight. On the occasion also the President greeted thousands of Sumbanese people who came from far away districts to see the number one person in Indonesia.